Happy Friday! This week we found what BIll Murray thinks of Tinder and how a wildlife conservation supervisor spends his downtime. Happy Friday! This week we have Bill Murray showing how Tinder works for him, a wildlife conservation supervisor dancing, an older boxer sparring with a young boxer and a couple of other gems. Hope you enjoy them as you welcome another weekend. It’s difficult to deny Bill Murray’s awesomeness. Here he is explaining how Tinder works. It’s probably safe say that age is nothing but a number. In this video, an older gent proves he’s still got it while sparring with a much younger man in the boxing ring. Poor weatherman Mike Sobel decided to bring Ripple, a mastiff, on-air with him. Let’s just say Ripple didn’t like the weather report. 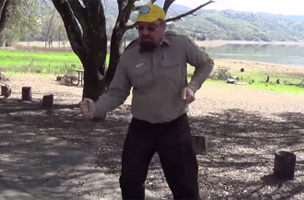 John Griffith, a.k.a Totem Magic, a California Conservation Corps supervisor, shows some impressive moves to “Bird Machine” by DJ Snake. If this guy was my supervisor, I would love going to work even more. If you own a cat, you know they can be super cool and then turn on you in a second. Singer Sadie Sunhome wasn’t paying attention to her cat, Cali, when this happened.